While "every Marine is a rifleman" as the saying goes, not all jobs in the Marine Corps are completely combat-focused. Someone has to make sure Marines have enough supplies and equipment no matter where they are in the world, and that's where Warehouse Clerks come in. This job, classified as a primary military occupational specialty, is important to keeping Marine units well-stocked. It's open from ranks between Private and Master Gunnery Sergeant and is categorized as PMOS 3051. Warehouse clerks are responsible for just about all the inventory and supply in warehouses, including receiving, inspecting, locating, storing, rotating, safekeeping, issuing, preparing, shipping, material return and disposal of supplies and equipment. 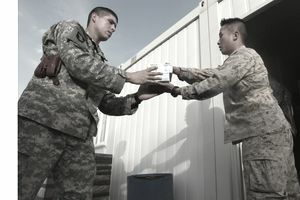 These clerks maintain personal computer and mainframe locator systems, conduct inventories, maintain records of subcustody principal end items, monitor shelf life items through CD ROM and the mainframe support systems, and input data entry transactions and retrieval of historical records. Marines in this job are licensed to operate machinery such as forklifts and tractors and operate bulk and small parts conveyor systems used in warehousing operations. They also maintain handheld optical character recognition scanners, devices, and multimedia retrieval systems. This job is responsible for ensuring supplies and other items in the warehouse are maintained as required. This may include using protective measures for items in storage, including open storage lots and hazardous materials storage areas. It's up to them to use and interpret detailed technical data from the Federal Logistics System in the care and storage program and store material per weight, cube, and clearance factors by categories of supply. To be eligible for this job, you'll need a score of at least 90 in the general technical segment of the Armed Services Vocational Aptitude Battery (ASVAB) tests. There's no Department of Defense security clearance required for this job, but you have to have a record free of convictions by court-martial and civilian courts. You can't have any nonjudicial punishment of larceny or theft. After basic training (boot camp) at Parris Island, you'll go to Camp Lejeune in North Carolina for the enlisted warehouseman basic course. This Marine job will open up numerous civilian career options. You can work in any number of warehouse positions, including stock control clerk, inventory clerk, storekeeper, data entry clerk, warehouse supervisor, or merchandise distributor.